My problem that I can’t seem to find a corresponding part number for my year, can anyone tell me if this is the right one. 8902A is my guess made in 1989, work week 02, January. the ET codes are secrets only MITSUBISHI knows. never published. 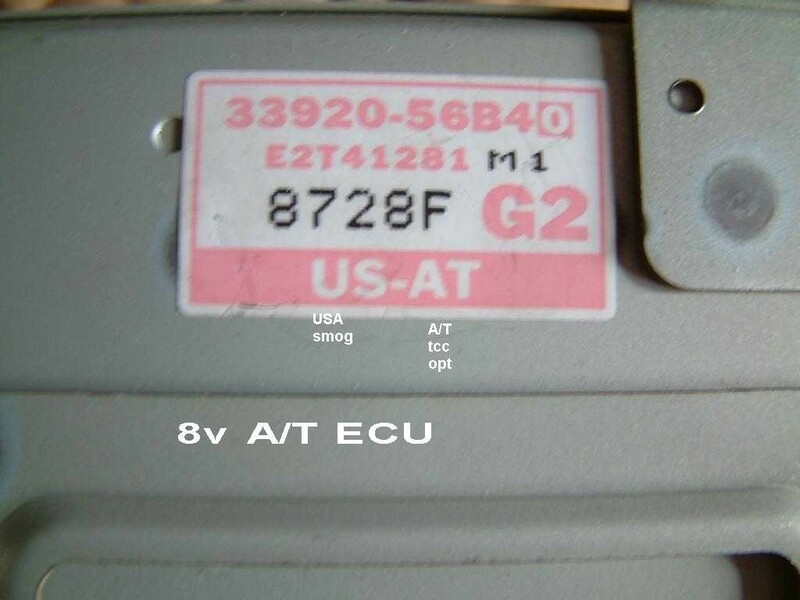 33920 is on all ecu prefix by suzuki, 60a = first gen.
60A ecu are 1989/90s 8valve engines, super old getting hard to find. the tag also show "US MT' ON it , if usa and is MT. you do know all 89s , made after about April. 1989 were made in CAMI, plant in Canada for many markets not just USA and CANADA, even Germany version, and more. before April made in Itawa Japan actual, and the VIN starts with J and not 2C. but that ECU is for canada only, and MT only. 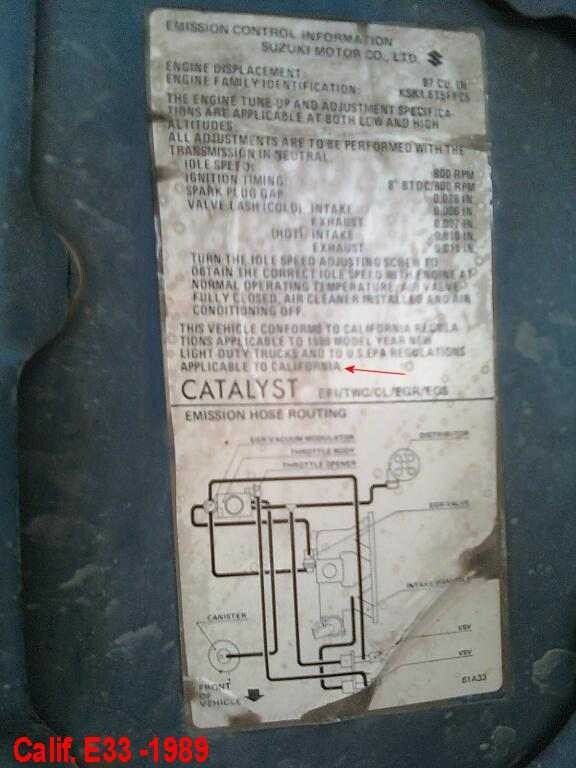 That ECU will have a dumber EGR logic, that you will never seen problems with that. the egr will be ok , unless it sticks open and car stalls. I haven’t had too many problems...I did a timing belt swap made sure it was perfectly in line with cylinder 4 TDC, set my lash, then set ignition timing last to cylinder 1. It seems for some reason it back fires a bit whenever I get over 55mph....It did misfire a whole lot and would almost jerk a bit when going 55 or over but I realized I was in too big of a hurry and got too excited and didn’t tighten the distributor bolt down tight enough lol....but whenever I fixed the ignition timing again i ran it up and down the road and it wouldn’t back fire a whole lot but you could still hear and feel it a little. Plus anything 3000 rpm and over the tac goes crazy(bounces from 3000 to 4000 and everywhere in between. Oh and I’m getting 15mpg right now. So I wanted to pull the ecu and make sure there wasn’t a problem there, I had a lot of other stuff to do to it interior wise anyways. Tank you for the awesome information if you have any pointers or advice on my problem I am all ears. cool, a real made in Japan car. you never said what country you live in. nor of you get smog tested. there. or the blue tag on firewall next to the battery. in canada , back then , they had gray market cars there. but you'd have called it a vitara if it was that. The ECU matches your car and country, in all cases. Everything else like type, and engine is blank...but my hood sticker is the really weird one from 1989. It’s image 5 on the link you sent me. open hood look up and under , see that huge white sticker there? they all have this unless hood , off other car ? or stripped and painted or from china as clone. it will say SUZUKI on the top even Trackers have that word. for usage in USA federal compliant "conforms" or even California. im answering your questions on ECU, they match both cars, country and engines and transmissions, and more. the newer the car the worse this gets. here is a real 89 Calif .
because of the internet and ebay in this modern world cars can get ECU from anywhere on the planet, and be wrong. but personally i bet your a10 is fully ok.
why not post symptoms first? if your car has a sticker like that , its and A10 CANADA ecu. Now someone registered a Canada car in USA, be sure not to tell the DOT that. or bad things can happen. what is the car doing wrong?